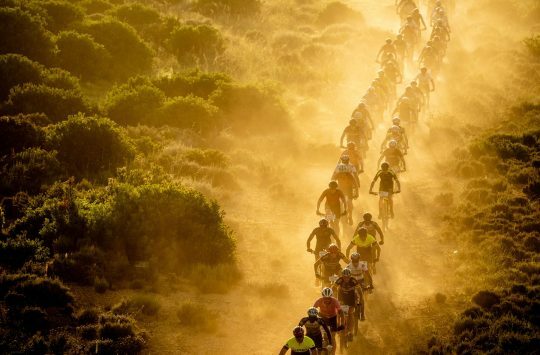 Known as one of the hardest mountain bike stage races in the world, the 2019 Absa Cape Epic is currently being raced right now in South Africa. The Cape Epic attracts a combination of the world’s fastest XCO and XCM racers, who team up into pairs to battle it out over the gruelling eight-day event. 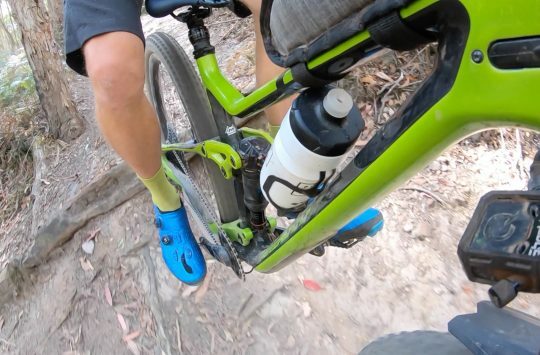 Due to the length of the stages and the severity of the conditions, teams are known to favour a slightly different setup than what you might see them race at a typical single-day XCO or XCM race. Durability and comfort are absolutely paramount to battling physical fatigue. 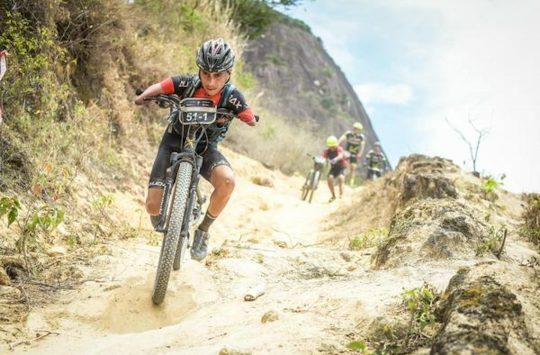 And while the singletrack is not regarded as being super technical or overly steep, careful consideration needs to be given towards mental fatigue, and how that can affect the rider’s ability to pilot the bike towards the end of a particularly challenging stage. José Antonio Hermida and Joaquim ‘Purito’ Rodríguez are racing the Cape Epic for the third time as a pair. 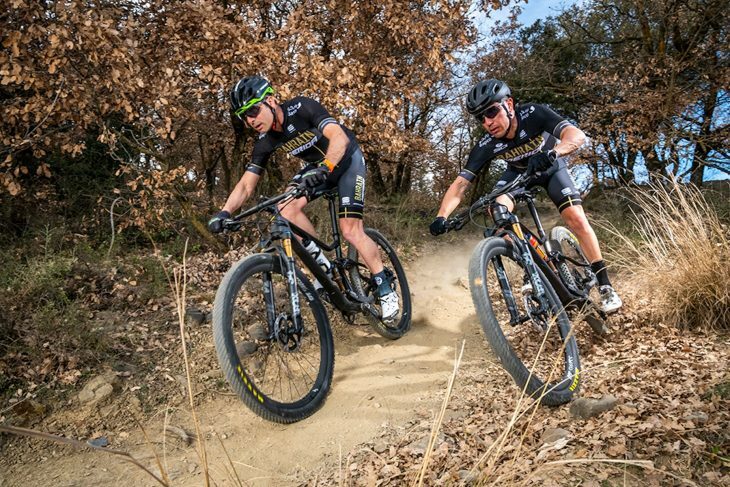 Comprising of MTB legend José Antonio Hermida and Joaquim ‘Purito’ Rodríguez (who are racing the Cape Epic as a pair for the third time) the Merida Factory Racing Team made an interesting move for the 2019 event. Instead of the short travel Ninety-Six XC race bike, the team has elected to ride Merida’s longer travel One-Twenty trail bike. “Well, we are fully convinced that the One-Twenty is the bike of the future”, explains Hermida. “This ultra-versatile machine is at the same level as the 100mm bike, with more or less same weight but increased stability and ‘safety’, lightning fast acceleration and lots and lots of fun to ride, in particular when the course gets more demanding’. The One-Twenty is a relatively new 120mm travel trail bike from Merida, and we currently have one on test – see our detailed first look story for more info. It’s pitched as being a capable and fun bike to ride, with relaxed geometry and either a 120mm or 130mm travel fork – depending on the model. The full carbon fibre frameset found on the 8000 and 9000 models is also pretty light at 2779g for a medium frame with the rear shock and hardware. 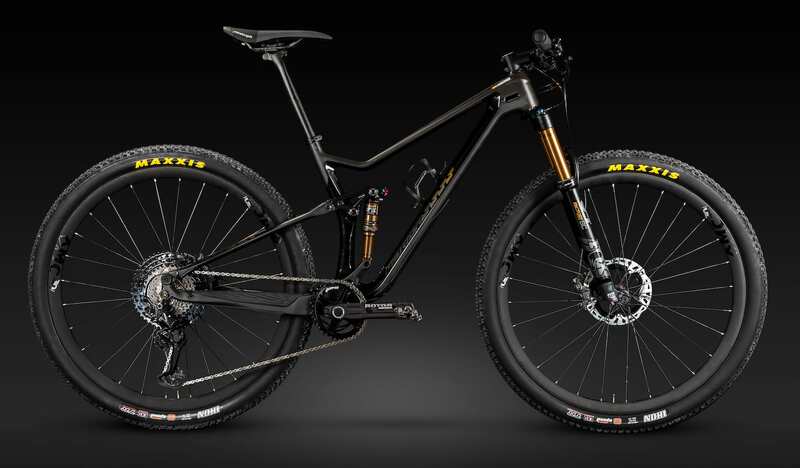 For the Cape Epic, the Merida Factory Racing Team has made some modifications to a One-Twenty 9000 in order to lighten and sharpen it up for the eight days of racing. The Merida Factory Racing team bikes have been modified over the stock One-Twenty trail bike. For a start, the rear travel has been shrunken down from 120mm to 100mm. It’s not yet clear how this has been achieved, but there’s a strong chance the 185mm eye-to-eye length of the stock trunnion shock is the same in order to preserve the existing bike’s geometry. Instead of a 55mm stroke however (which is what the bike comes with as stock), my guess is that Merida has gone with a shorter 50mm stroke in order to bring the rear travel down. You’ll also notice there’s no dropper post, which the team has omitted in favour of a lighter rigid carbon seatpost. Other spec details include 30mm wide DT Swiss XMC 1200 wheels, XTR 1×12 shifting, Rotor cranks with oval Q-rings, and a Fox Kashima suspension package that includes a 120mm travel 34 Step-Cast fork. The complete bikes are claimed to weight just 10.7kg, which is pretty impressive given the heavier duty wheels and 120mm travel fork. Comfort and control are important for Cape Epic competitors. 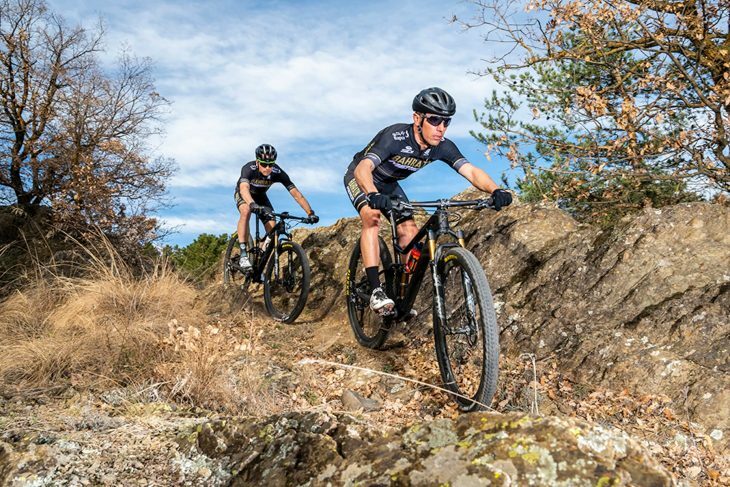 So far, the Merida Factory Racing Team is doing well to prove the racing credentials of their modified One-Twenty 9000 trail bikes. After racing the prologue and two stages, Hermida and Rodríguez (I know, I’m thinking indy-pop band name too) are currently sitting in first place in the Masters category, and 30th overall at the 2019 Cape Epic. If you’re keen to follow the racing action, head to the Cape Epic website. And if you’ve got any questions for us about the modified One-Twenty 9000 the team is racing, or the One-Twenty 8000 we’re currently testing, pop ’em into the comments section below!